Basalt Snowmass Village firefighters found flames shooting out the roof of this residence in Gateway Subdivision in Old Snowmass Tuesday night. 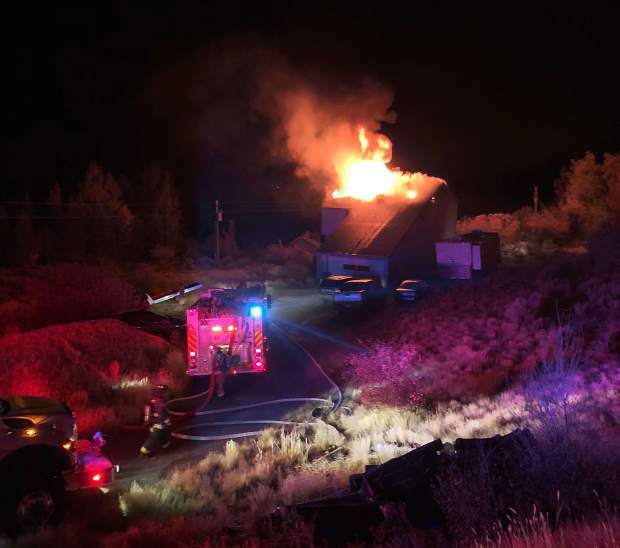 Seven people were displaced Tuesday night when the home they occupied in Gateway Subdivision caught on fire after a failure of the fireplace or flue, according to Basalt-Snowmass Village Fire Chief Scott Thompson. The fire was reported at 11:46 p.m. at 76 Elk Range Drive in Old Snowmass. “Upon arrival of the first fire engine, the entire second-floor attic and roof was on fire,” said a statement from the Fire Department. “Firefighters quickly learned that all occupants of the home were safely out and accounted for. “The firefighters attacked the fire from outside the home, a defensive attack due to the collapse of the ceiling and roof of the second floor,” the statement continued. The merged Fire Department responded with three fire engines, one ladder truck, two water tenders, an ambulance, 13 firefighters and two fire officers. No firefighters were injured in the operation. Due to structural damage from the fire and water, the home has been deemed uninhabitable. The local chapter of the American Red Cross responded to the scene to aid the displaced residents with temporary accommodations. Thompson said a warming fire had been started earlier in the evening in the fireplace. “The occupants noted sounds, extreme heat from an adjacent wall and quickly attempted to put out a fire that was found in the wall out without success,” the Fire Department’s statement said. 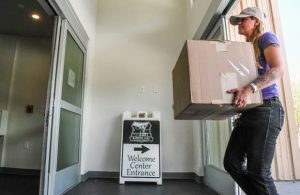 The Pitkin County Sheriff’s Office, Pitkin County Regional Emergency Dispatch Center, Holy Cross Energy and American Red Cross assisted in the response.